← “A Harvest of Ripe Figs”: music, magic, and mystery starring a lesbian queen now available in eBook! Sometimes Queen Shulamit has to run a kingdom, but then there are the quiet moments, when she can just chill with Princess Naomi like any other mom. 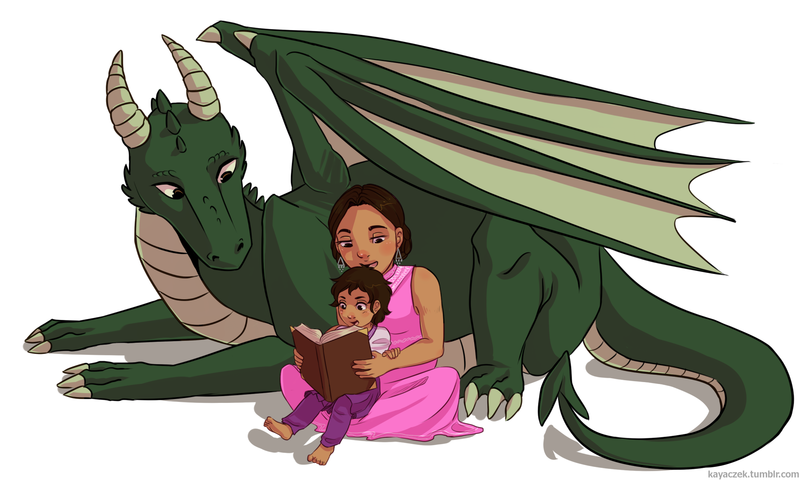 ….well, any other mom who’s got a dragon for a close, personal friend! You can find Shulamit’s latest adventure A Harvest of Ripe Figs on eBook for $4.49 here and here; the paperback (preorder link) is expected by Feb. 11. Pic by Kayaczek; the first two books in the series are The Second Mango and Climbing the Date Palm. This entry was posted in Uncategorized and tagged baby, books, children, Dragon, dragons, lesbian moms, lgbt parenting, mom, mommy, reading. Bookmark the permalink.